From Osaka, we went up to Kyoto, which was the capital of Japan for several hundred years. The trip up there is amazingly simple, as there are several competing rail lines in Japan. So we had the choice of JR (the national line) or Hankyu, the regional private operator. We went up by the JR express, which was nice enough, and only took about 40 minutes to go the 35 miles north. This may seem slow, but when you consider the population density in Japan, the mountains, and the traffic invovled, it’s really quick. Enjoying the hotel's common space. region with our hotel. Once we came up from underground, Kyoto impressed us with its small-town feel. There were lots of wood-frame buildings, kind of like a ski village feel. 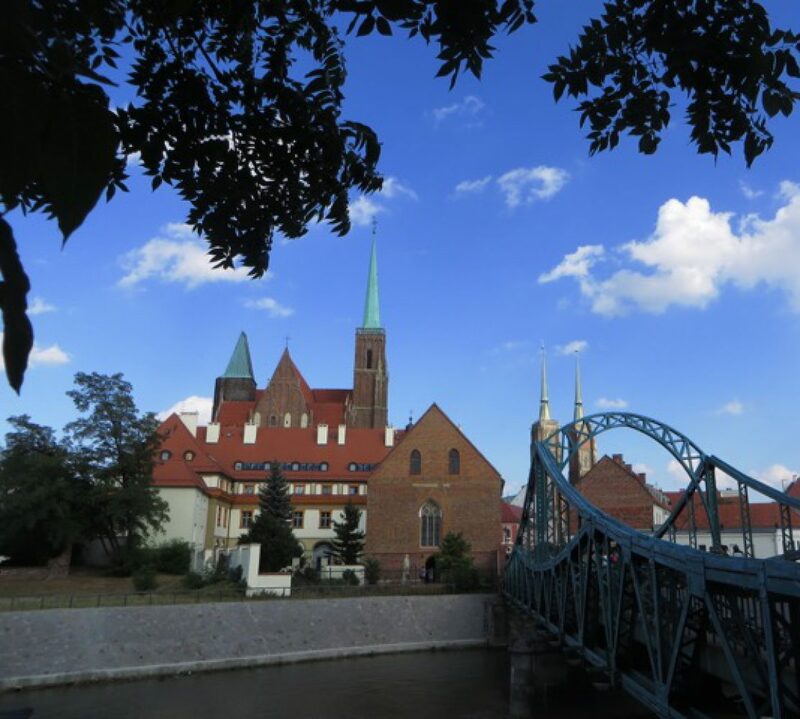 Our hostel was located on the same street as a traditional, covered market, with fresh fish on display next to tofu and radishes, and kindly old merchants watching us warily as we dragged our suitcase down the narrow streets. 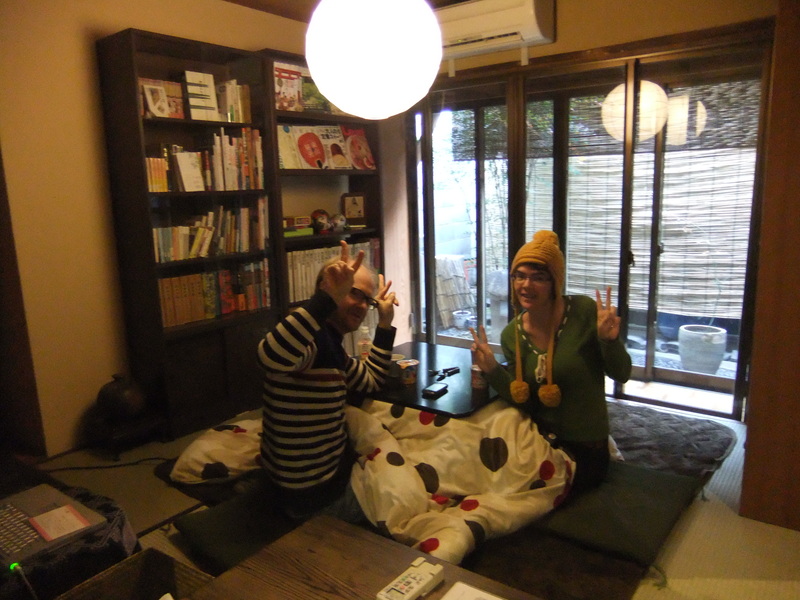 Finally, we got checked in to the Hostel Haruya, which was a charming, traditional old Japanese house with sliding screens, tatami floors, and a narrow, steep staircase that was best gone down backwards, like a ladder, to avoid falls and injury. Our host, like everyone else we met, was friendly and generous, always telling us the local sights, and how to get there. into the hills surrounding the Eastern edge of Kyoto. This random walking, like all walking in Kyoto, took us up into a temple grounds. This one happened to be under renovation, though the grounds were still beautifully landscaped. 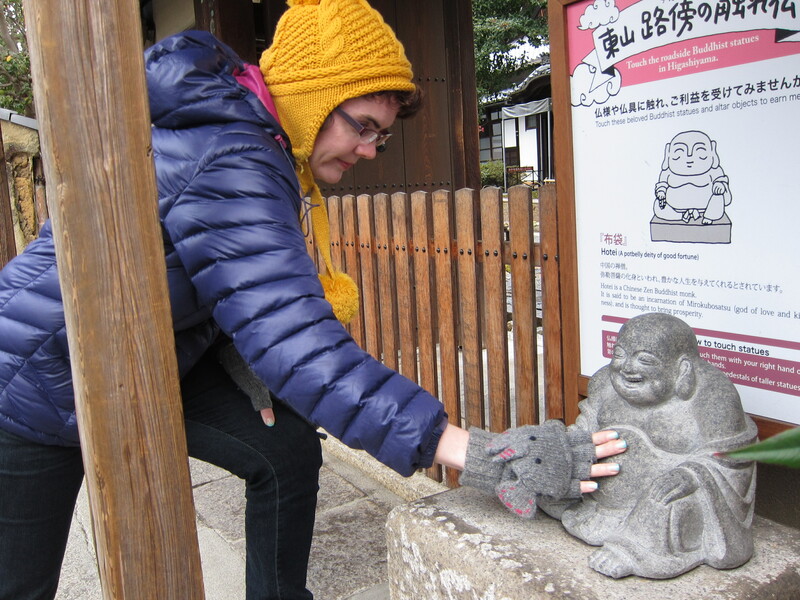 We passed through an old traditional village just below Murayama park, an area filled with narrow cobblestone streets, kind of a touristy area, with signs pointing out several sculptures whose bellies you could rub for luck. We tracked down several, and took our fill. From there we wandered back into the city, stumbling onto one of the most famous districts in the city: Gion. This is where the greatest concentration of the traditional Geishas live and work. 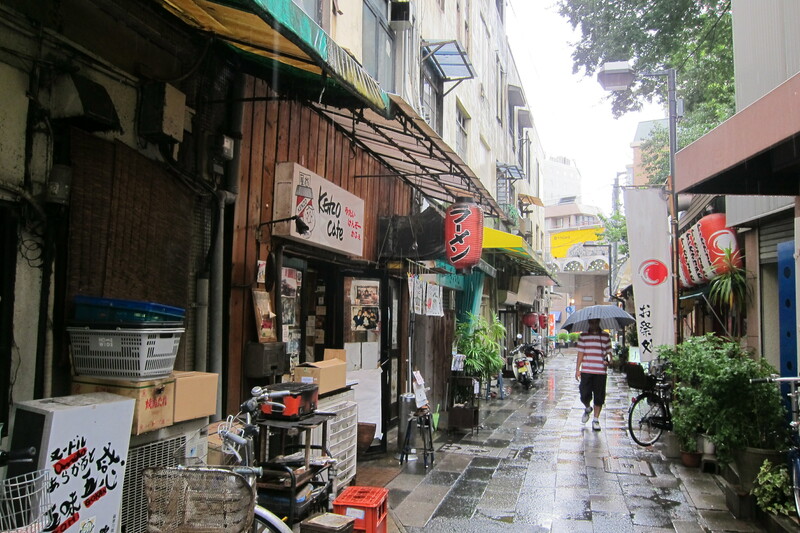 The Gion district has elegant lanes of reed screens, cobble streets, and a bamboo lined creek. There were a few adult-looking storefronts, but there’s also a lot of good food in the area. It was here that one night we found a place serving Paella from a chef who had trained in Spain. The next night we ate at a sushi place with a highly affluent-looking crowd, served by stern, older master sushi-cutters. On the third night, still hungry for more sushi, we found a Kaiten Sushi restaurant, where the sushi is put on a conveyor belt and led around a counter much like a toy train on a track, and you grab plates till either the conveyor belt is empty or you can’t stuff in any more. Each plate was 130 Yen ($1.60), which sounds like a good deal until we looked up and found the plates were stacked up to our chin. The sushi kept coming, but we were no match for it, and left stuffed and happy. 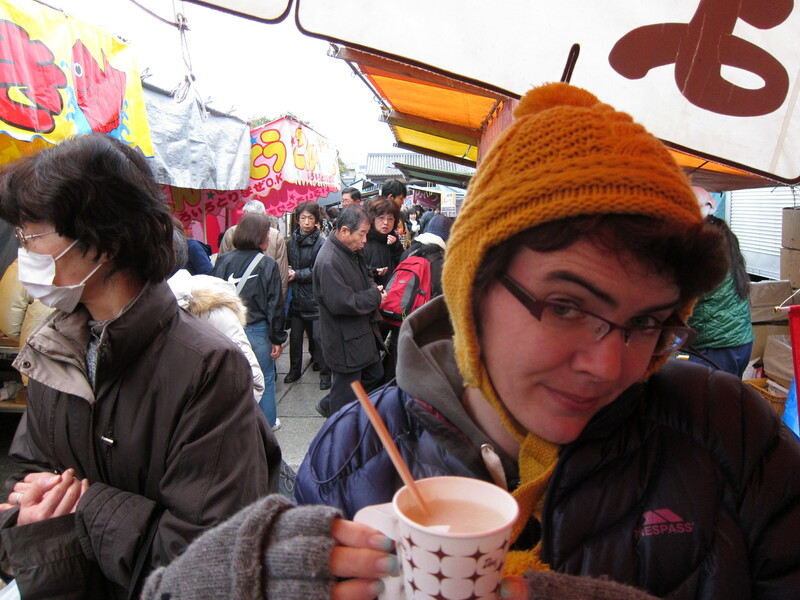 The next day we went to the Toji flea market. It was amazing. It is in the Toji temple. Beautiful. We were walking along the aisles for two hours and we barely saw anything. As the day progressed and the crowds got thicker it started to rain. Annoying, but we were amazed and stuck with it. There were nick-knacks and tchotchkes, fabrics, yarn, snacks, paintings, clothes, plants, tools, anything and everything you could ever want. I was on a mission. There is very little fabric down in Mokpo. And most of it is yucky rayon and polyester. I was shopping for fabric. I got some amazing silk pieces intended for making kimonos. I wllll be making a skirt. I also bought two thin scarves that I will use as a belt. They were made with hand dyed, hand spun silk. Awesome! Afterwords a traffic cop directed us to this fabulous noodle shop that looked like Sister Fun exploded all over it. I had soba noodles with broth, green onions, and raw quail egg. Mike had an enormous bowl of Udon. I think we sat there for an hour people watching and decompressing from the crowds before we went to see more temples. 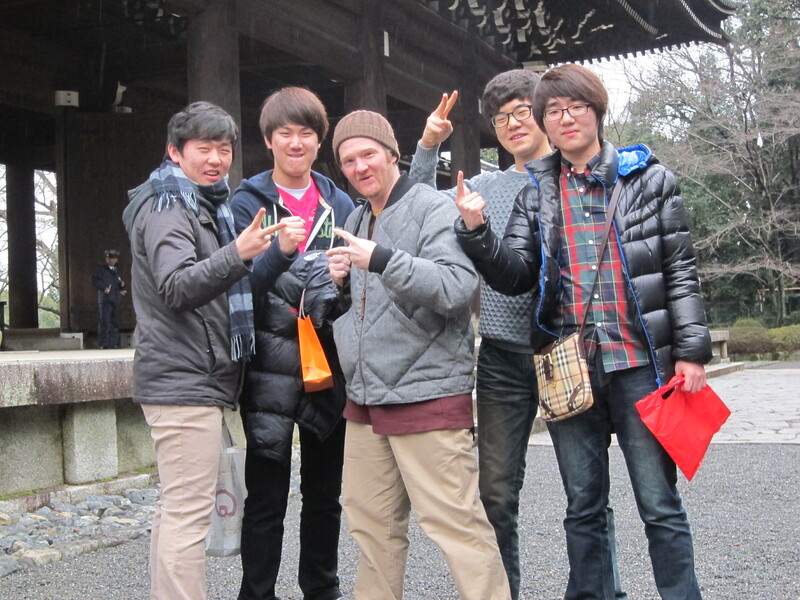 So we were only a little surprised when we were walking through a quiet Japanese temple and we heard “Waygooken!” I (Akasha) turned and saw five boys pointing at us. I really wanted to point out that they were gaijin (Japanese for foreigner.) Turns out they attend the university in the biggest city near us. They asked to take our picture, also common, and we took theirs. The pose was “rock, scissors, paper! A deer, asking for a snack. With his head. There is a deer sanctuary in the park where deer are assisted with illness, delivery, and have their horns filed down. 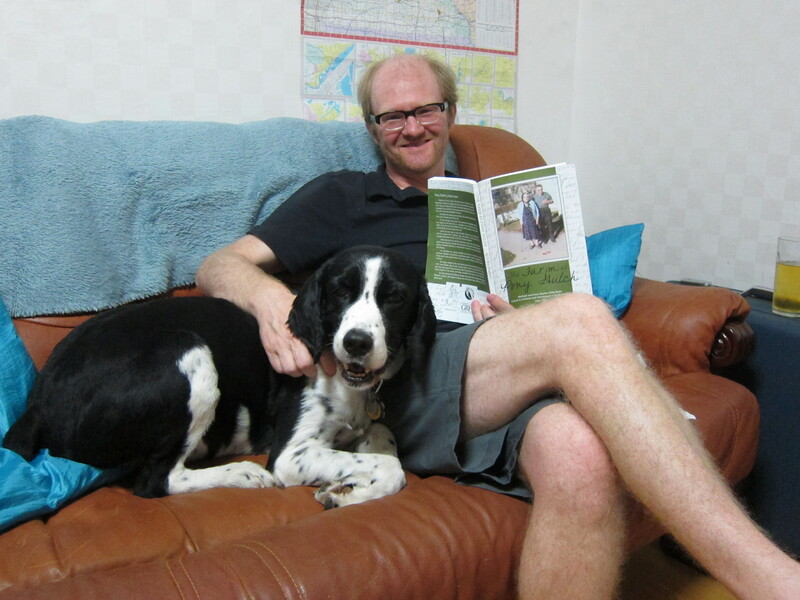 We were also lucky in finding a guide in Nara. At the train station’s information booth, we were told of a free guide service provided by the local YMCA. 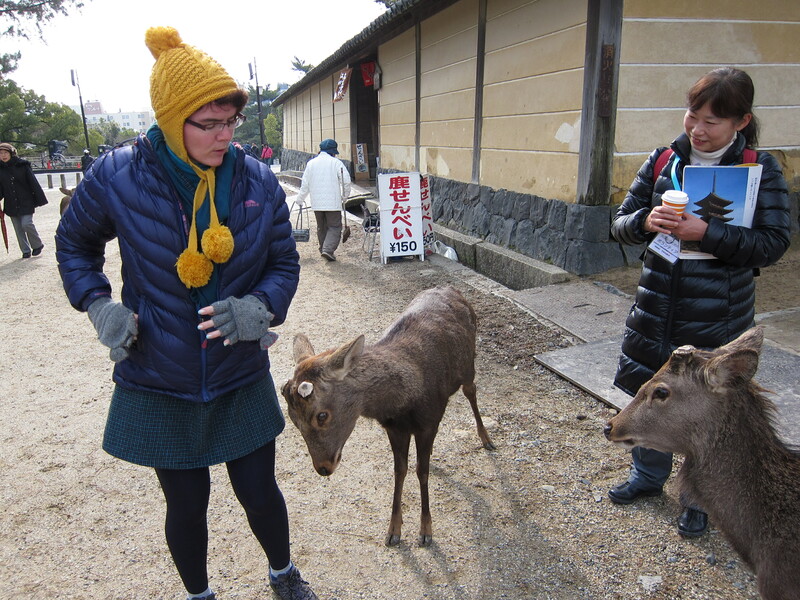 We snapped up the offer and for the next four hours were guided around Nara by a lovely woman named Yasuko, who teaches English at an immersion kindergarten. 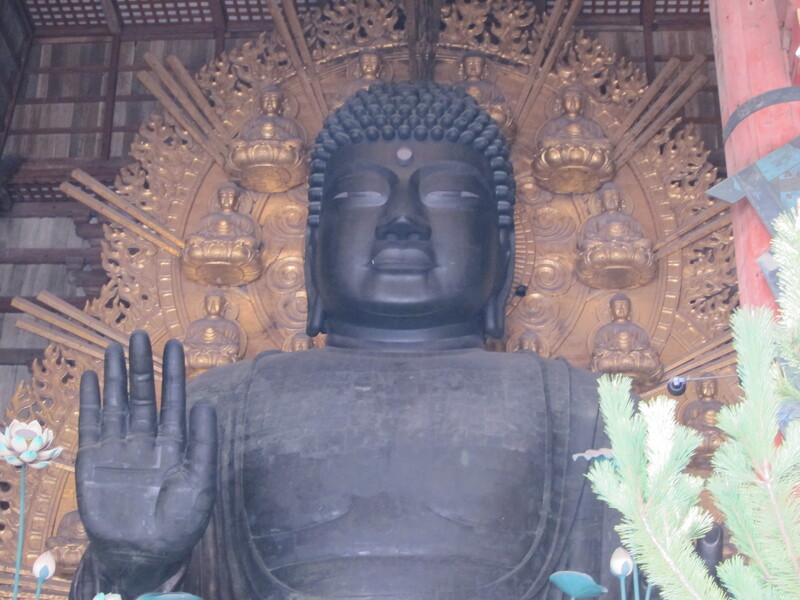 We saw the two main Buddhist temples, one of which is the largest wooden building in the world, and houses a bronze Buddha which is several stories tall. Here, one of the support posts has a small tunnel carved into the base. It’s locally know as ‘Buddha’s nostril’ and, according to legend, anyone who crawls through it receives enlightenment in their next life. Mike decided to take the challenge, and after a few moments of panicked scrambling (the opening is about the same width as his shoulders), he made it through! So now he has enlightenment coming in his next life, which is, you know, better than never. With all that luck, we moved on to the third major site in the Nara park, the large Shinto shrine. Shinto and Buddhism are separate religions, but many Japanese overlap. Our guide said that many practice both, so shrines and temples are often kept together. The Shinto shrine we visited is a sharp contrast to the Budhist temple, which are set in fields. 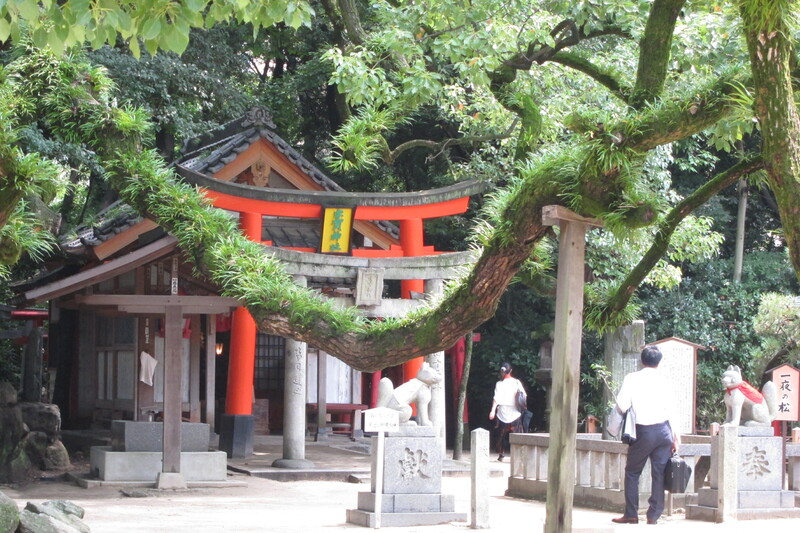 The Shinto shrine is set on the mountain side in the middle of an primeval forest. 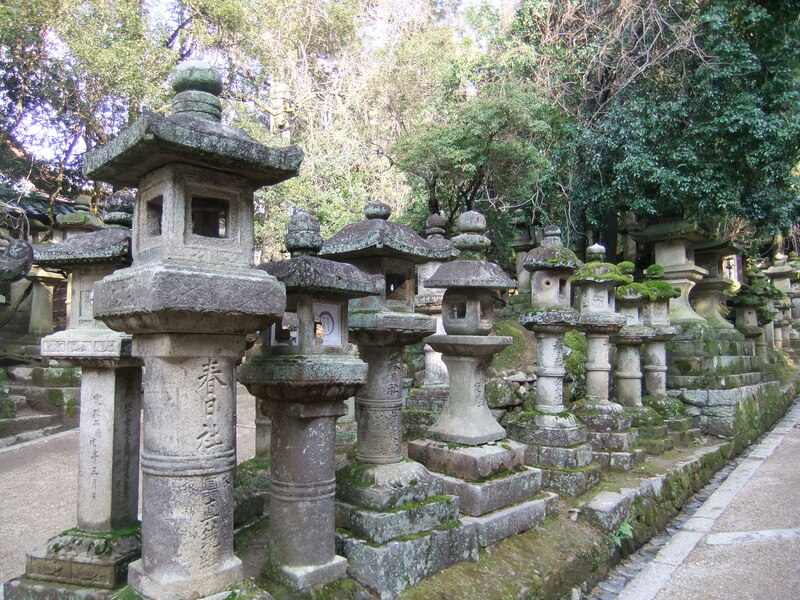 Also, they have collected over 2,000 stone and wooden lanterns over the years, and they stand alongside the wooded paths, often two or three deep. They are also mossy, and it gives the scene a peaceful, surreal feeling. From there we returned to Osaka, which we covered in our previous post. Wow! I can’t believe we ate it all. As public school teachers in Jeollanamdo, we get 24 days of winter vacation. 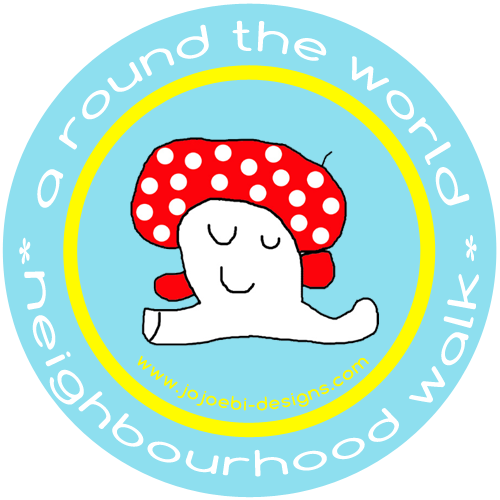 (There are also national holidays, summer vacation, and a vacation for renewing our contracts.) Anyway, we took 10 of those days and went to the Kansai region of Japan. It was an overwhelmingly mind-filling trip. It was a deliciously stomach filling trip as well. 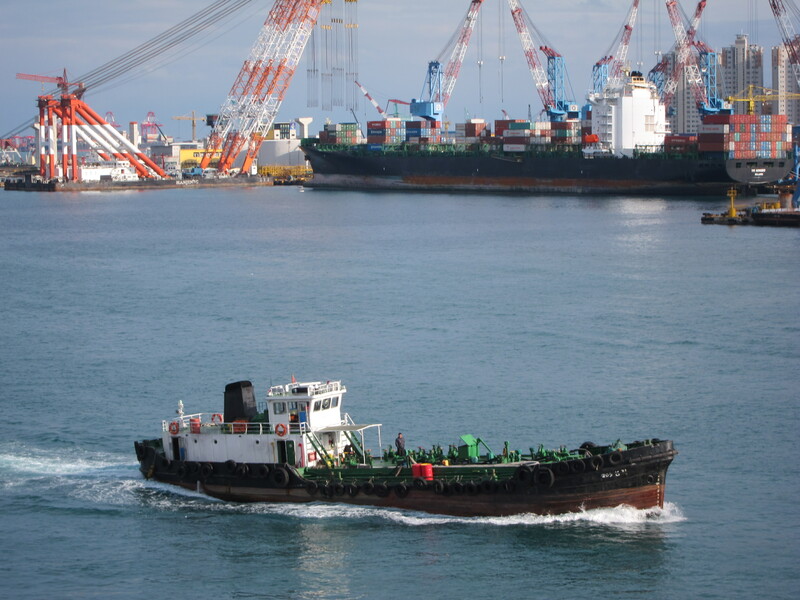 After a night being swayed gently to sleep by the rocking of the boat, we arrived in Osaka at 10 or so on Wednesday morning, and began to look around the city. Our previous stay had been in Fukuoka, a smaller, working class city; by contrast Osaka is larger (22 million in the Kansai region), more cosmopolitan, with a host of world class attractions including huge ferris wheels, long suspension bridges, and great art museums. We intended to see as much as we could in the five days we had. Our first hotel was the Hostel 64 Osaka , a quaint hostel run by an architecture firm, so it was artistic and comfortable, with a great, friendly staff. 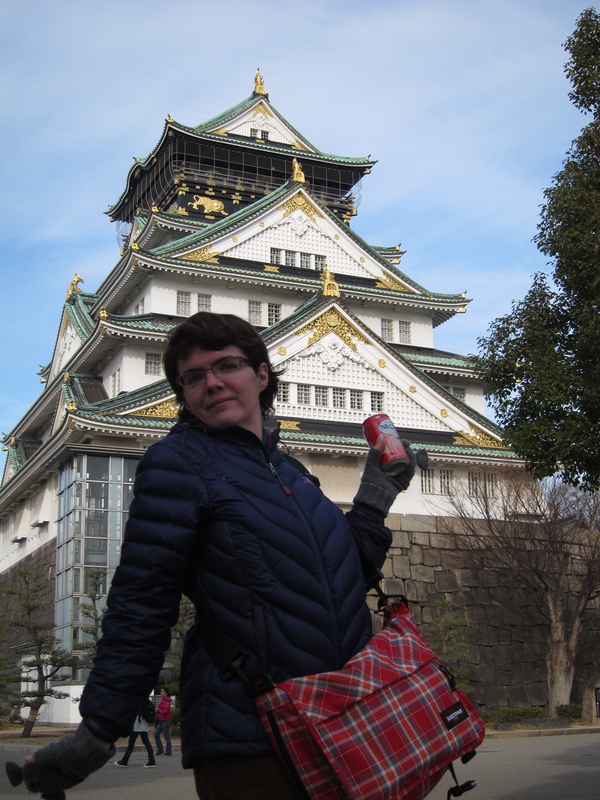 So we checked in, dropped off our bags, and started the walk across the city to Osaka castle. From here, we took the subway down to the Shinsekai district to get a look at the great tower that was first built over a hundred years ago, then rebuilt after World War II. 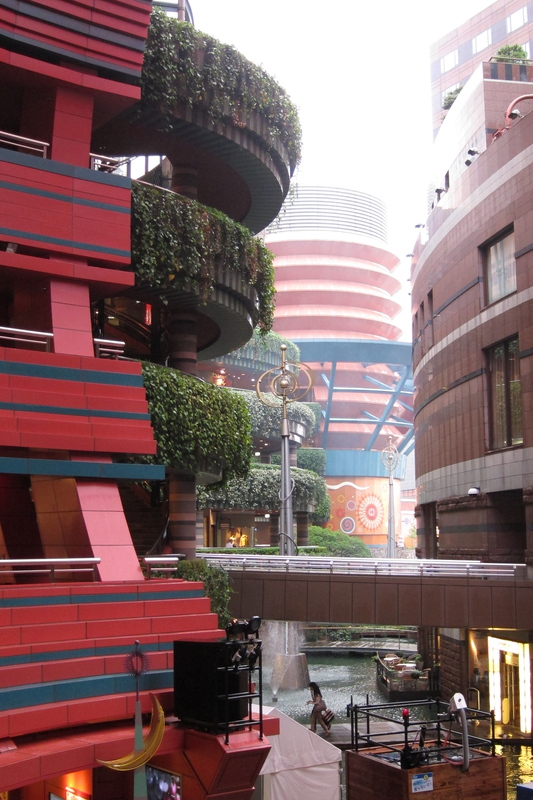 The district around here is retro-futurey, with lots of exposed steel, neon, cheesey golden statues, crowded streets and colorful ‘characters’ who want you to eat in their shops and play pachinko in their parlors. Then, it was up to the HEP 5 shopping mall, where there is one of the two great ferris wheels of Osaka. We went up just as the sun was setting, so we saw the city spread out below us in the great reds and oranges of the sun reflecting off the glass and metal of the buildings in the great sprawl of Osaka. It was romantic, and beautiful, and we wished we could go around again, but it was getting late and we had to find dinner. 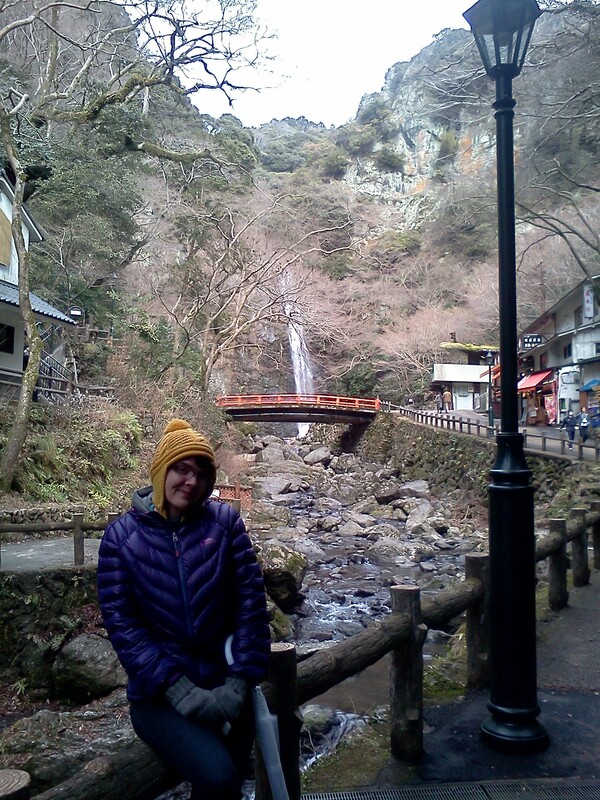 The next day was cold and rainy, which was a disappointment, as we had planned to take a short train ride up to Minoh and see a waterfall in the region. But no matter. One of the hotel clerks, a very friendly woman named Nami, gave us directions to the art museum, which was right next to her favorite Udon noodle place. So, we spent the afternoon with a belly full of fresh-made noodles, looking at some recent modern art by Yayoi Kusama, who I’d never heard of but has been creating conceptual and ‘obsessive’ art since the 1950’s. Good, but weird, stuff. 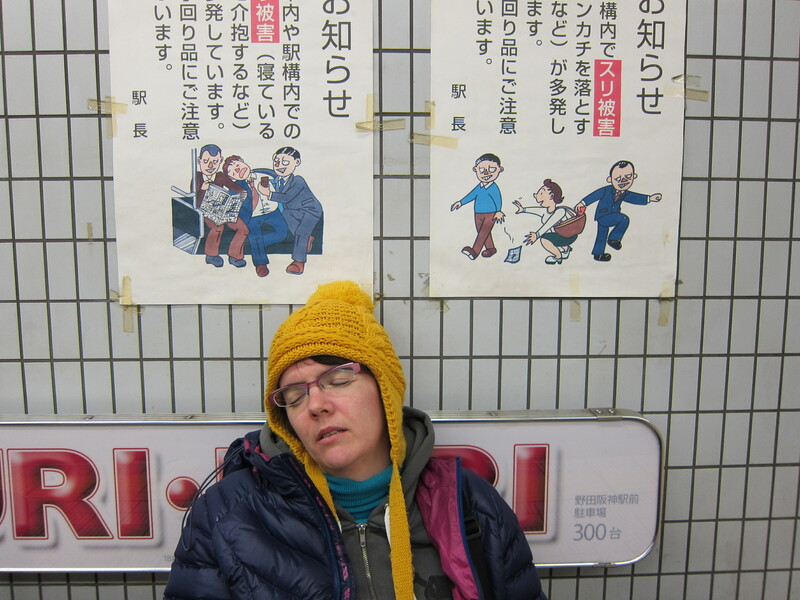 After completely exhausting everything there is to see in Osaka in 36 hours (Mike jokes) we went up north, to Kyoto, former capital of Japan and still its traditional cultural heart. But Kyoto deserves its own post. When we returned to Osaka, three days later, there was surprisingly still a lot of city to see, and a lot of great meals to be eaten. 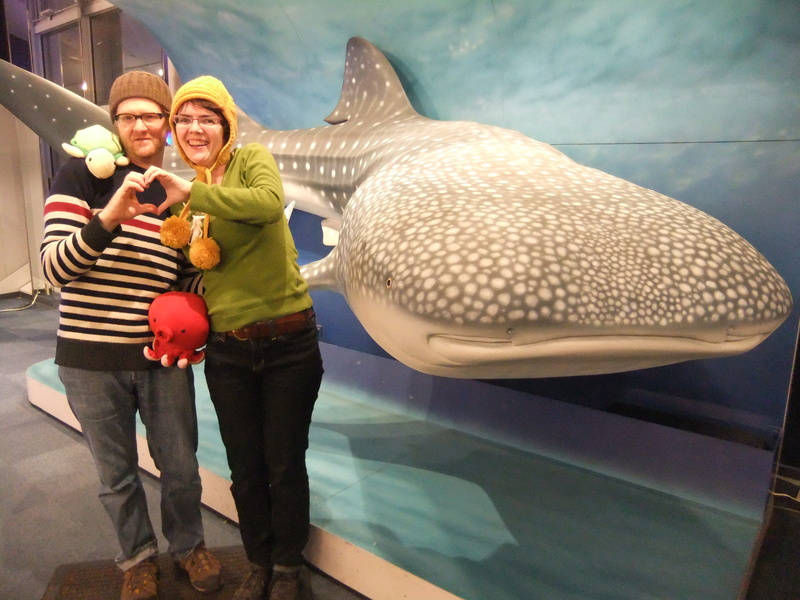 First, we went to the Osaka aquarium, which has one of the largest tanks we’ve ever seen. This one was large enough to hole an entire whale shark, a school of groupers, and devil rays about the size of a beach umbrella. We stood enchanted, watching them circle, for at least two hours. Then there were jellyfish, giant crabs, and seals that wanted to kiss Akasha through the glass. It was amazing! After the aquarium, we’d planned to ride the other ferris wheel in Osaka, a monster called the Tempozan, which is one of the largest in the world. 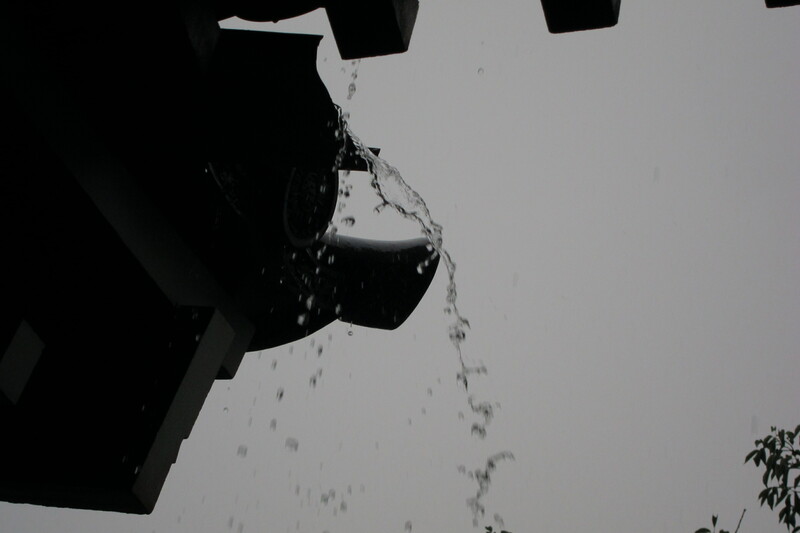 However, due to strong winds, it had been shut down. Akasha was very disappointed. But, this meant we could go have burritos in a place across town. Bad news, however, was that the burrito place was closed, so we had to go across the street to a bistro that served up some nice pizza, a fruit tort that was pretty incredible, and wine by the glass. They were playing Amelie on their wall . 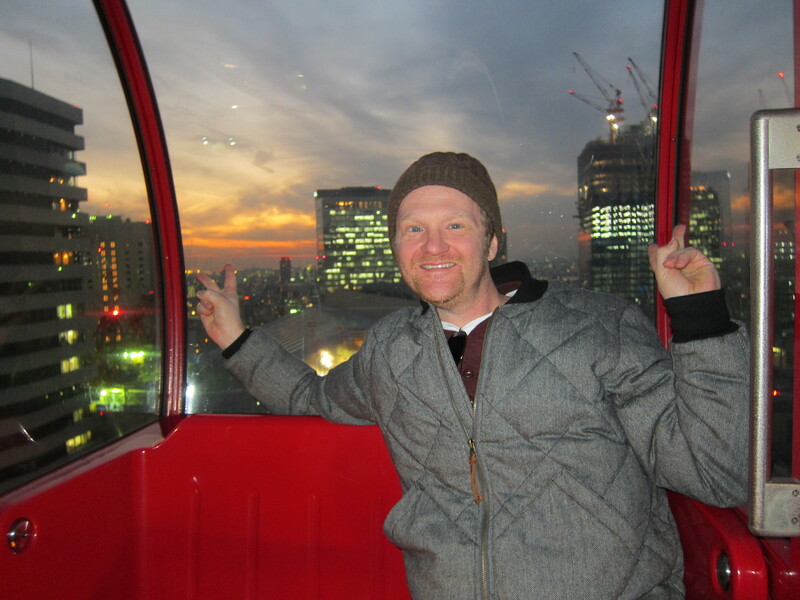 When we got back to Osaka, we made another attempt at the Ferris wheel, and it was working! So we went around and got another spectacular view of the massive sprawl of Osaka. And then feeling lucky, we returned to El Zocalo, the burrito place that had been closed the day before, and… it was open! So we had a lovely dinner of burritos, homemade chips, and Dos Equis. El Zocalo is run by some Osakans who lived in San Francisco for years and the burritos were the real thing. 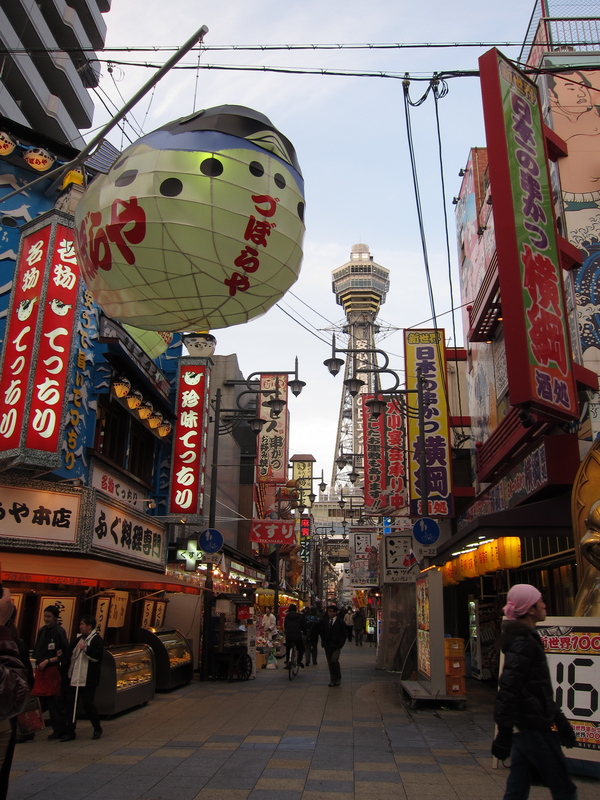 Osaka is a fantastic international city. 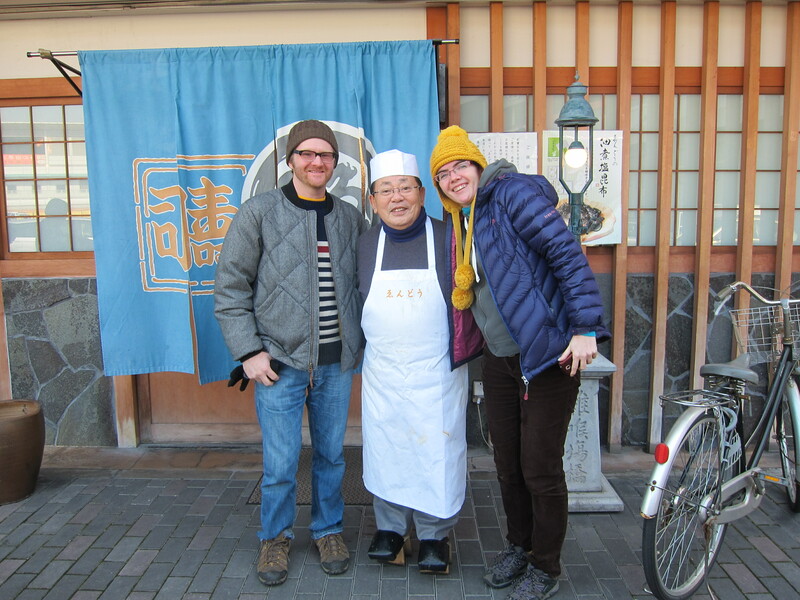 We also chatted with a nice guy named Guido, who turned us on to the best sushi place in town, which we vowed to visit before our ferry left the next day. 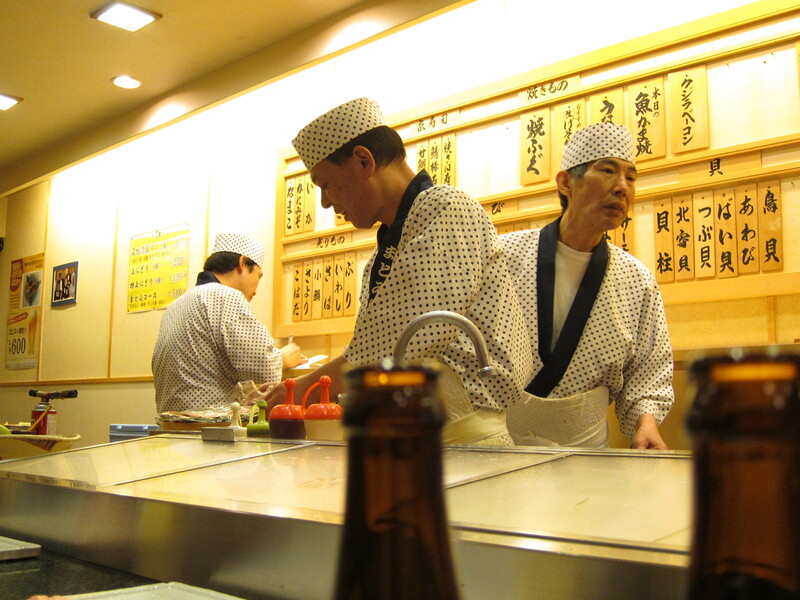 The next day we ended our Osaka adventure by visiting Endo Sushi at the Osaka fish market. This place is amazing. It is allegdly where the fish buyers go to taste what they buy. It is open from early dawn until 1 p.m. These bloggers did an excellent job describing the experience, I’ll let them do it for us.